Summer is here – let’s head to the beach! If you’re not able to visit the beach this month you can create the appearance of seafoam in your garden if you plant Tiarella cordifolia. Tiarella cordifolia gets its common name from its bloom which looks like seafoam, especially when planted in large sweeps. I have this plant growing in both partial and deep shade in a moist area in my garden. It makes a lovely low-maintenance groundcover that can be evergreen during warmer winters. It spreads by sending out stolons and can easily be divided in spring or fall. It’s attractive to many bees, especially in early spring, and brightens up those darker areas in a woodland garden. 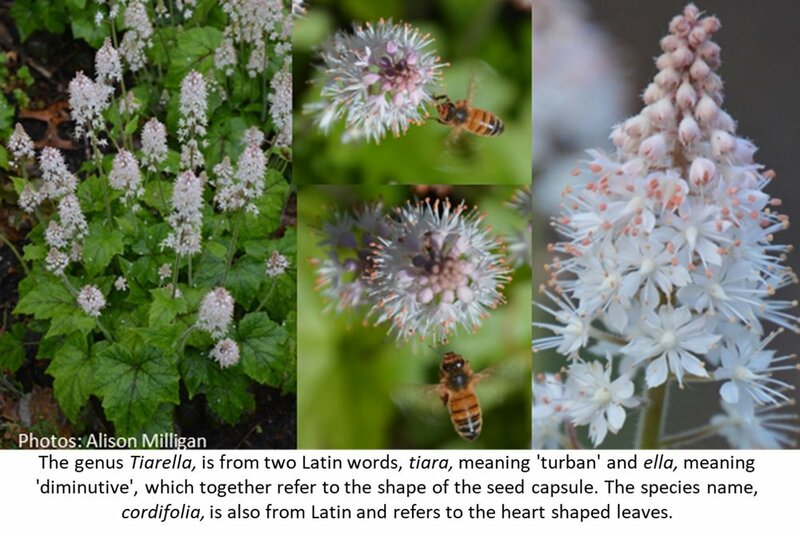 Tiarella cordifolia is a clump-forming perennial with delicate, star-shaped flowers that sprout numerous stamens. The very conspicuous stamens with white linear filaments and oval anthers are what give the plant its “foamy” appearance. I love Tiarella cordifolia for its long bloom period and weed suppressing ability.